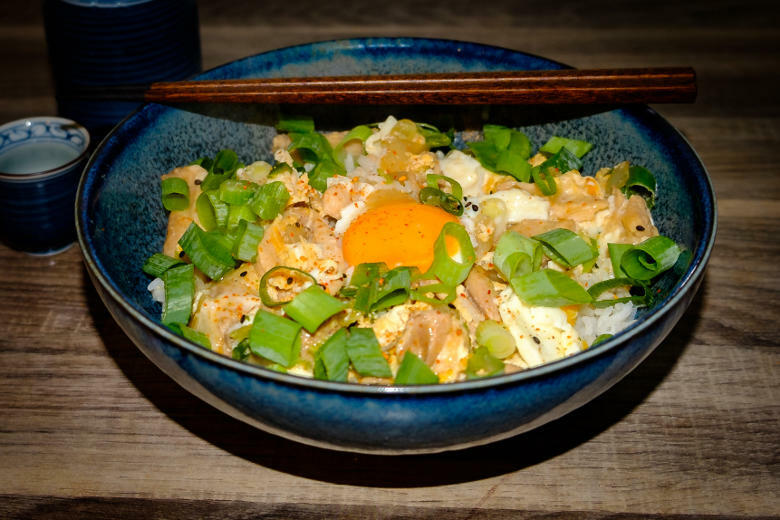 Oyakodon is a Japanese rice dish; the name means parent and child. Referring to the chicken and eggs used in the recipe. Oyakodon is prepared in one pot except for the rice. Some ingredients might be difficult to get for some of you. Dashi powder is made from fish or seaweed, best to compare with stock cubes. Mirin, a sweet rice wine used for seasoning. And Nanami Togarashi, Japanese seven-spice powder. In any case, you should be able to get all these products at an Asian store, otherwise just get them online. For example, in this shop. Fortunately, the dish is easy to prepare once you have all ingredients. preparing 10 minutes, cooking time 20 minutes. Boil water for the rice. Meanwhile, cut the chicken into thin strips. Clean the onions, cut them into half rings. Prepare the dashi (2/3 bag in 400 ml of boiling water). In a bowl shortly stir the four eggs. Cut the spring onions into pieces. Add the rice to the boiling water and cook according to package instructions. Heat a wok or large frying pan. Add the dashi, 3 tablespoons of Mirin, Soya, Sake and bring to a boil. Insert the onions and cook for about 5 minutes on high heat. Add the chicken and cook over high heat for 10 minutes (stirring occasionally) until about half of the liquid has dissolved and the chicken is cooked. Add the spring onions, set 1/3 of the spring onions apart. Slowly pour in the eggs, try to divide it evenly. Turn down heat and put a lid on the pan. Let this simmer for about 3 minutes. If you think the eggs are still too soft, just let it simmer a little longer. Divide the rice between two bowls, divide the chicken egg mixture over the bowls, also add some of the liquid. Lay an egg yolk on top (only if you like of course). 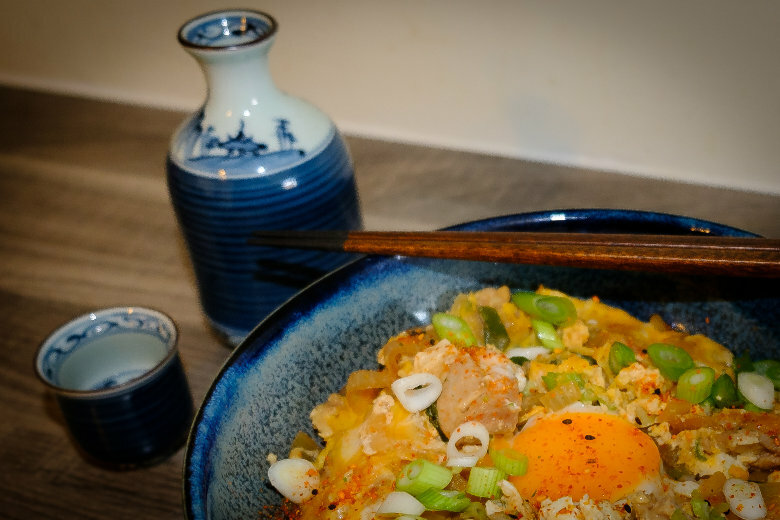 Sprinkle with spring onion and Nanami Togarashi to taste. * The use of raw egg is never without risk in case of Salmonella.